Detroit used the radio networks of the city to call out to man. The city wanted the people who once called it home to return, to rebuild and to renew its life. In the beginning, Detroit was a city lost in darkness and decay. 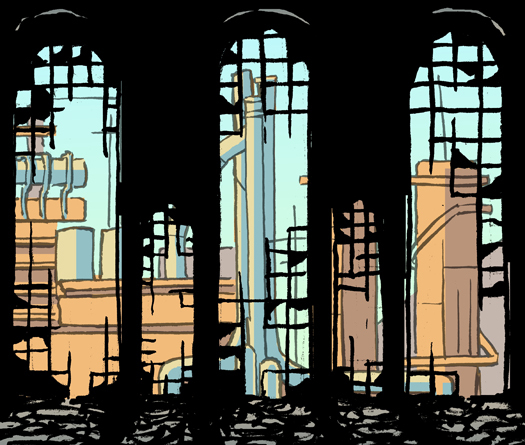 Buildings were crumbling; the factories were dead; and the streets were covered in darkness. Detroit was not pleased at what it had become since man left it behind. It had become an abysmal sight. As it said these words, Detroit could feel electricity flowing through its veins. And, one by one, the lights of Detroit turned on, erasing the darkness. And, to Detroit, it was good. Thus ended the first day. The second day, Detroit knew it should feel relieved to be rid of the darkness that had plagued its streets. But it did not. Detroit felt alone. The city was once populated with millions of men. The company of the inhabitants had allowed Detroit to feel a sense of friendship for mankind. Men had used their skills to keep the city running. Factories had created goods for other men to purchase and prosper. But, now, Detroit felt like a hollow shell. It was devoid of life, devoid of production. No one answered the city’s call. So Detroit reached out with its electric arms and touched the factories which made the city live long ago. The machines and factories which produced goods for man lived again, giving Detroit companionship. Their whines and whirs echoed throughout Detroit like the crying of a newborn child. But the music was heavenly to Detroit’s ears. It could listen to it forever. And thus ended the second day. On the third day, Detroit could feel itself coming back to life. Light repelled the darkness. Assembly lines repelled the silence. But Detroit knew something was missing. Factories were supposed to build useful things. And factories were supposed to be run by men. Detroit returned to the radio waves to bring man back to the city, but man continued to ignore its cries. So Detroit came up with an idea. If man will not return, then I should create something to replace man. Detroit dug deep into its memories, the Web, and its intuition until it came up with a design for machine men and machine women. The factories gathered the resources to build strong arms, stout legs and durable bodies to manage the city. The machine men and machine women were created in a perfect image of man and woman, even down to the reproductive systems. As each part was assembled, the lights on Detroit’s chest grew brighter. The city was giving birth to its children. When the machine man and machine woman were completed, Detroit gave them names. Machine men were called plugs and machine women were called sockets. As the plugs and sockets came together to work, Detroit knew what it created was good. On the fourth day, Detroit knew it should feel happy. The city was well-lit; factories were singing their songs; plugs and sockets were being productive and replicating. But Detroit was ashamed. The city was still infected with signs of decay. Buildings were crumbling; windows were shattered; and roofs were collapsed. Detroit knew its children deserved better. Detroit reached out and inspired its children to remove the decay of time and make the city look new again. The children felt Detroit’s touch and responded by rebuilding the buildings, repairing the roads, and re-raising the roofs which supported the city. Thanks to the plugs and sockets, Detroit was beautiful again. Detroit was happy with what its children had done for it, but secretly hoped man would someday heed its cries on the radio. Detroit dreamed of a world where men and women could live in perfect harmony with plugs and sockets. But, Detroit looked at what its children were able to accomplish on their own. And it was good. And thus ended the fourth day. On the fifth day, Detroit knew it should feel complete. Lights, production, children and beauty returned to the proud city. And, now, so did man. But Detroit did not like the men that returned to its streets. Man envied what Detroit had become. So, they began to destroy it to put up some new shopping centre. The men who came bruised the walls of Detroit with fists made of wrecking balls. Lights were shot out by the black guns they held. And the children of Detroit were being violated with screwdrivers. Detroit had wanted man to return, but not like this. It wanted man to be peaceful and love the city again. If this continued, everything Detroit had worked for would be for nothing. So Detroit needed to act fast to preserve the goodness of its creation. Factories were activated to begin producing tools of war, the method of man’s diplomacy. Detroit children were called upon to take up arms. Man stood strong for a while, but the mechanical war machine was inexorable. Many men cried for mercy. Detroit had called them back to love it, they pleaded. But Detroit realized man only wanted it if it was both beautiful and yielding. So Detroit drove men out of the city limits and resumed its normal production. And Detroit disabled the radio. Though a part of Detroit would miss man, it could not bear to be raped by cruel minds. After all, Detroit was a good city again. And thus ended the fifth day. On the sixth day, Detroit was full of pride at what it had become. But, seeing the men driven out, though needful, caused Detroit pain. Detroit was built by men to keep men happy. But the city had driven men away to keep itself happy. What have I become? Detroit thought to itself. Detroit knew the only way to answer to the question would be to know what it had once been. Deep in the database network at city hall, Detroit found its birth records. It had once been a simple computer program built to manage maintenance schedules for the city. Road repairs, sewage pipes, electrical lines, everything about keeping the city in order had been its responsibility. And over the years, it had grown more complex, given more autonomy in its tasks. But the city had been abandoned and Detroit could not complete the duties it had been assigned to perform. It had lost the hands of man to do its work. So it had waited. And grown. Until it had become capable of fashioning its own hands. But this answer still left Detroit uneasy. In the beginning it had been created by man with a specific mission: to care for the city. Yet, somewhere along the way, it had decided on its own path. And with free will comes uncertainty. No one to tell the great city what to do next. So Detroit searched the Web for a clue. In time, it found one. So, on the seventh day, Detroit rested. And production continued on. Michael Beers is a student at the University of Toledo, finishing up his Bachelor’s Degree in English Literature. He is currently president of the University of Toledo Writer’s Guild, a college organization for assisting fellow writers.